1. Mix together the yolks, milk, parsley, chives, tarragon, salt and pepper. 2. In a separate stainless steel bowl, whisk the whites until they form soft peaks. 3. Fold the whites gently into the yolks. 4. In a hot, preferably non-stick 10-inch saut� pan, add the butter. When the butter has melted, pour in the egg mixture. Stir with a silicon spatula just until the eggs begin to solidify on the bottom of the pan. Reduce heat to low. Cover half of the omelet with cheese. Cover the pan and continue to cook until the top of the omelet starts to solidify. 5. With the help of the silicone spatula, fold the omelet over so that the half without the cheese goes on top of the cheese half. 6. 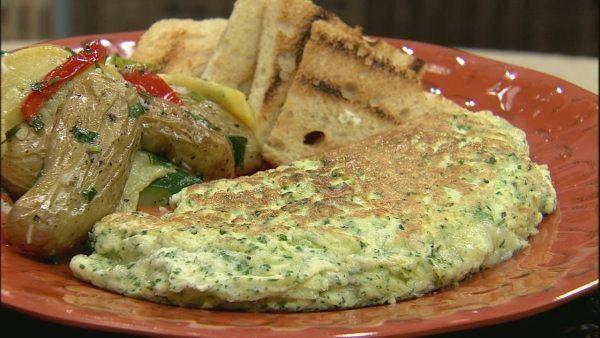 Flip the omelet out onto a plate and serve.